I am sure a lot of you that are logging on today are thinking what the!! Has he not sorted this update out yet? Well the answer is a simple no. I know it looks a mess at the moment, but it will look great when it is all finished and the colours and backgrounds will all change. I am off lure fishing this morning in the hope of a late Bass from Ringstead. I know that one or two are still being caught so I am ever hopeful that I can get my Bass tally started off for this year. Wind: It will start of with a brisk Northerly wind but die off to almost nothing. Chesil Beach: Coloured water but fairly calm with a 1.5m swell. Chesil Beach forecast: It will be a cold one on the beach today and the Northerly wind will blow from right to left right down the beach. With big tides and still plenty of colour in the water, day time fishing should be good. Expect the odd Cod with plenty of Whiting, Dabs, Pout and Dogfish. I know you might find this hard to believe but I did see someone fishing with Mackerel feathers yesterday. Although they didn’t have any when I spoke to them, they claimed that they had caught 18 yesterday!! Portland: These big tides are by far my most favoured when fishing the rock marks. It seems to bring the fish a lot closer in to explore food scources that are not normally available to them. It is one of the rare occasions that hard back crabs fish really well. Velvet Swimmer crabs seem to out fish normal shore crabs. Unless you are lure or float fishing, you have to expect high tackle losses when fishing Portland. However the results can be well worth it. The main species at this time of year are large Wrasse, Pollock, Bull Huss and Rockling, with the odd bonus Bass. Portland Harbour: Flounder and Bass are in the harbour at the moment. Quite a few people have been fishing the harbour over the past few days and some have had good results. I was chatting to one angler called Dave, who fishes the harbour every couple of months, whilst visiting his family. He caught 3 nice flounder whilst I was with him and one of them was almost 2lb in weight. HE was using two hook flapper rigs baited with Ragworm on size 2 hooks. Weymouth Bay: Lots of Flounder are being caught in the Harbour. Preston has produced Whiting and Pout on night tides, with a few School Bass and Flounders during the day. Poole Harbour: Reports from Poole just seem to get better. I am guessing that the colder temperature is having a positive effect on the Flounder fishing. 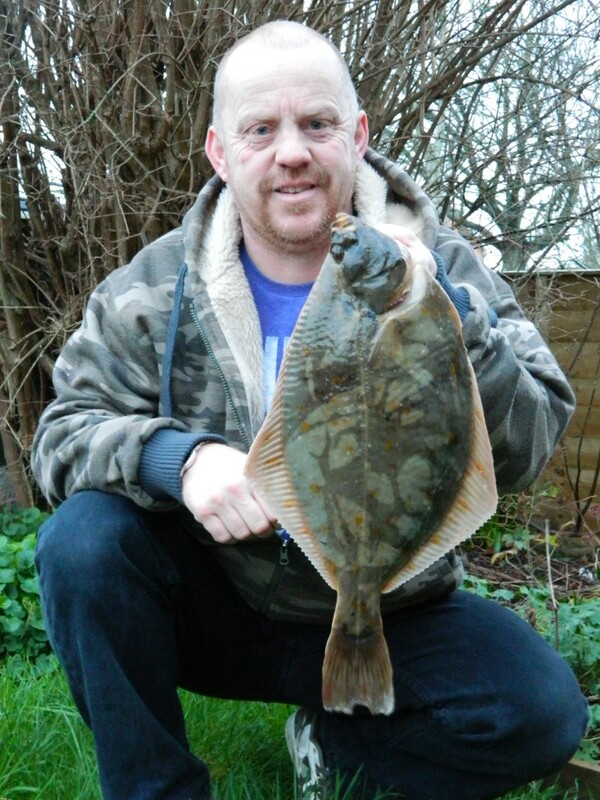 Paul Fox sent me a nice picture of a Flounder that he caught after reading my forecast for Poole recently. He caught it on the last cast of the day. Paul’s fish is a great contender for fish of the month. If you think you can do better then get catching and see below for more details. Boat & Kayak fishing: Tomorrows boat trip is full and hopefully we will get out and catch loads of decent fish. I will be arranging more trips the next one could be next week, so if you are interested in one in the future drop me an email and give me an idea of dates so I can put together a trip. Unfortunately due to fuel increases the half day trips will increase to £30.